My boxing trainer Matt [I’ll change his name, for now] and I are hanging out, talking about George Orwell and Facebook, when three guys in business-casual come edging down the alley. “Watch ‘em,” Matt says. “They’ll look through the windows, but they won’t come in.” Seized by mischief, we grin and beckon. Two of the guys avoid our gaze, the third grins in panic and shakes his head. Huddling on the sidewalk, they eye the space with something more than self-testing curiosity. Something less honest. Honest is the brown-skinned teenage girl who came through that door as I was in the ring today and asked, almost inaudibly, if she could take a flier. Honesty, I’ve learned, is the only requirement for being here. But it’s not what’s flickering – timid but shrewd – in these men’s eyes. My hackles rise. You mean no good. “Property developers,” Matt says. Of course. The same old thing. It’s London, after all. 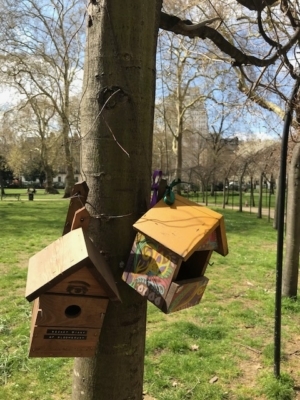 On Monday, Extinction Rebellion kicks off in Parliament Square. The neon-bright stickers cover bus-stop shelters and parking signs and utility poles: Day-Glo skulls and EXTINCTION: EVERYONE GONE FOREVER. Rebel against the corporate control that puts short-term profits over our existence. The logo, a sharp-edged hourglass inside a circle, makes the point clear: Because we are so very nearly out of time. Time is churning at the bedrock and buildings and streets of London, this city I love, and at the Alabama acres I love back home. Time is sharpening the need for sustainable life, for housing and food and ways to live in dignity with people you love, in your beloved place. Money reverses or accelerates that corrosion, makes and remakes and destroys. Naively, it had not occurred to me that this particular place – this gym under a South London railway arch, with its sweat-smell and foot-scuffed boxing rings and laughing voices and speed bags with their logos worn away (the drilling rhythm of leather rebounding against metal and a taped-up fist, ONEtwothreeONEtwothreeONEtwothree, is as elusive and seductive as a waltz, ringing call-and-response across the floor to raise the shout I like what I’m hearin’ over there! ), this place that in Matt’s words is not easy to walk into but asks for your honesty, and lets you in – that this place might be under threat from those big bad forces of property market and gentrification that are abstractions until they come to your front door. John Keats – so fiercely beloved, by my students and by me – pleaded “for ten years, that I may overwhelm / Myself in poesy; so I may do the deed / That my own soul has to itself decreed.” When he wrote those words in 1816, he had only five years left to live. What would you do, how would you live, if you accepted the certainty that you are running out of time? How do you identify, and work for, and fight for, the things you love in the time you have left? Like any big city, London shows you how the pursuit of corporate profit has painted life on earth into a corner. The one-percenters have contingency plans: fortresses in New Zealand, underground bunkers like the one in Gebe’s Letter to Survivors. The rest of us have – what? More agency, perhaps, than the creatures that have gone already here in our Anthropocene, bound to human folly like the wartime animals memorialized near Hyde Park with the heartbreaking line They had no choice. Like John Lewis-Stempel’s Where Poppies Blow or the National Theatre’s “War Horse,” that monument leans on the ugly-crying button in my brain. It’s a weird neuroscientific fact: marionettes or puppets activate our tears. So do animals. Yet loving our cats or our GMO’d dogs (WTF is a “whoodle?”) or the animated cute endangered creatures™ on our screens can’t wake us to the world beyond our skulls: we love to buy, and we love to have “conveniences,” and therefore we are making it impossible for anything but ourselves, and eventually even for ourselves, to live. 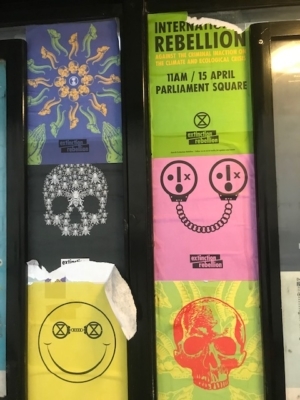 Extinction Rebellion signs at a bus stop, Bloomsbury, April 2019. Whose fault is it? Corporate profit, swollen beyond reasonable entrepreneurship into a self-replicating Moloch. Whose fault is it? Our own credulous, convenience-seeking selves. Both are steamrolling the “diversity” of biological life and of the human, urban, social, and place-based life we claim to value. Keep an eye on “value,” because as creatures suffer, language suffers too. “Values” become another cliché in corporate-land (thank you, Stewart Lee), greenwashing and whitewashing the real pursuit: profit. Every corporation knows “diversity” is good. Yet one thing the twenty-first century is showing us about the manager class (just as Brexit is showing about the political class) is how thoughtless our self-proclaimed corporate masterminds really are, how little they understand (what does the average “business major” actually read? ), and how deeply antithetical true diversity is to their assumptions and their weltanschauung. (Read James Hamilton-Paterson on how managers ran British handmade brands into the ground.) By contrast, real resilience comes from multiplicity and redundancy, the inherently diverse “backups” that natural systems build in to protect themselves. Yet once paved, Darwin’s tangled bank becomes sterile and monochrome, able only to cascade damage on downstream. “If we compare crimes by the mischief of their effects,” wrote Thomas Hobbes in 1651, “the same fact, when it redounds to the damage of many, is greater than when it redounds to the hurt of few; and therefore, when a fact hurteth not only in the present but also, by example, in the future, it is a greater crime than if it hurt only in the present: for the former is a fertile crime and multiplies to the hurt of many; the latter is barren.” So how is erasing the eel-pie shops and small hardware stores and bookstores and quirky Soho bars and boxing gyms – and sending all those once-local business profits into the pockets of international conglomerates – “developing” London at all? For real “diversity,” look at Ladbroke Grove, which students and I had the privilege of walking with its residents last week. Butted up against Notting Hill, the home of Londoners proud of their Afro-Caribbean heritage, the haunt of rock stars and reggae shops, it’s very much itself, and very much alive. On each corner – memorialized with blue plaques developed by the Nubian Jak Community Trust – are stories that I’d never heard: Kelso Cochrane and Claudia Jones (part of the same African-American Communist movement that included Richard Wright) and Amy Ashwood Garvey. Around the famous Portobello Road Market are coffee shops with men speaking Portuguese and Spanish, and stalls with the only okra I have seen to date in London. On the street we met Pepe Francis – “Pepe Francis, MBE!” as our friends excitedly pointed out – steel band artist, Army veteran, and director of the Notting Hill Carnival Enterprise Trust. We heard stories reminiscent of those in Isabel Wilkerson’s The Warmth of Other Suns (in the US context) and in David Olusoga’s Black and British: coming from the Caribbean and from (of course) Jamaica after the Second World War, invited to help build Britain back up, the new arrivals often found a lack of homes to rent, a closed suspicion, deliberate and casual racism. Yet talking to the people who love Ladbroke Grove, I saw that they really do love it. Loving a place is powerful. So is the close-to-the-ground knowledge it gives. People will usually do fine working things out for themselves if they are given the support they need and left to get on with it. But we need the gripping texture of the local, the diverse, the small, the human-scaled. The New Statesman last week described ecofascism, a fantasy of a world in which all humans (except the right, white kind) have vanished to leave nature alone with them in some kind of ecstatic “purity.” Talk of overpopulation or too-muchness risks heading into this territory: too much of whom? Who says? Yet it’s obvious that humans are exceeding this planet’s capacity, helped by one big thing: corporate profit and its pursuit, which multiplies our desires for convenience and instant gratification and material comfort like a magnifying glass training light on helpless ants while exacerbating the inequality and scarcity that makes us crave our comforts even more. This is the real destructor of life on earth, the real destructor of diversity in all its forms, the real fascism: the commercial, the slick and easy and apparently carefree, the promise of thoughtless pleasure, purchased for a price whose costs are always hidden and externalized onto somewhere else. It glares from each surface here in the city, where every fellow Tube-rider wears the same platform trainers and cropped trousers and sacklike tan coats and the same white headphones snake down each shirtfront and the ads up and down the escalators flash lithe brown-skinned models (so diverse!) in eight-pound shorts and twenty-pound dresses made by fifteen-year-olds in Bangladesh, where theatres rerun musicals of rerun movies and mattress ads clash with pleas for hurricane relief and winking erectile-dysfunction dudes with idiotic grins. Vitamin ads are omnipresent: “Tired of Being Tired?” This morning I saw one slapped with an Extinction Rebellion sticker, right over the model’s yawning mouth. “Tired of Being Tired?” Yes. You could say that. Of course, London will never be smoothed out. It’s London, after all. Thank God. But even what snags the eye is snagged on money, too. Suddenly in the Tube car a fat man with a trumpet starts playing “When the Saints Go Marching In” (that New OrleansTM classic.) An abashed woman trails him down the aisle, toting a cheerfully thumping drum machine almost as big as she is. “Busking is illegal on the Underground!” the loudspeaker warns. At the next stop they’re out through the doors, drum machine ticking away down the platform. The poor you have always with you, sighs Jesus in the Gospel of John. But in Brexit-muddled, austerity-maddened London, the poor are under greater pressure than ever. “I wonder,” mused a young man near me the other day, “what homeless people will do, now that nobody’s got any change?” Contactless: the all-too-apt symbolism of a society where the actions and consequences and loose ends and unclarities and conversations and secret histories of life in a particular place are inconvenient. Unprofitable. Tidied out of sight. SHINE SHOES, blares a handlettered cardboard sign. HELP A HOMELESS MAN EARN AN HONEST LIVING. “If you don’t have a product,” asks James Meek, “what do you have? Nameless things, unlabelled things, things without brands and logos, generic things, free things, things without margin: love, death, loss, disappointment, unpossessed beauty.” What can help us in our world as it is? What makes “the unlabelled things,” the loved things, visible. What holds them up above the tide. What’s that? It’s art like Mike Nelson’s “The Asset Strippers” at Tate Britain, which asks you to look again at what you only thought was disposable. It’s words. And teaching. My new book project is about teaching the Romantics in the era of climate change and political crisis and the Internet as modern life threatens to eat us and itself at the same time. The past is the only renewable resource left to us – the only thing that’s getting larger instead of smaller. It’s essential to our survival, because it puts in gentle check that raging human ego, that insistence that we and our desire in this present moment is all there is. Because amid the ads and the concrete there is loveliness, and love. The fox slipping through the garden below our classroom window. The bruised optimistic apricot and blue of the spring sky. Young plane-tree leaves just coming out. Friends old and new. The joy of hunkering with notebooks and students in the garden where Keats sat to write “Ode to a Nightingale.” Writers seldom have total faith in our world, our words, ourselves. “Many a man can travel to the very bourne of Heaven,” Keats wrote in a February 1818 letter, “and yet want confidence to put down his halfseeing.” Still: we try it anyway. We are running out of time. But I pray that heightens our desire to fight for what’s worth fighting for. World population 1950: 2.5 billion. World population 2020: 7.5 billion. Not person says, “Give me a smaller portion.” Every person says, “Give me a larger portion.” Resources are finite. We can be democratic and altruistic in principle, but we are egocentric and autarchic in practice. And tribal. Virtually all of the misfortunes contributing to our 21st century angst are the result of exponential population growth. Over the next 50 years, conditions will become immeasurably worse.